Here's my approach to listening to music: At any given time, I have about a dozen songs that I'm really into. I listen to them on repeat whenever I need some background noise or just want to jam out for a bit. I put those songs into a playlist called Currently On Repeat, and I switch them out as I get tired of old songs and find new ones. And now, armed with this playlist and the power of Apple Music, I'm going to try something new on the blog. I'm going to share this playlist with you and give you an opportunity to enjoy the songs that I'm currently into. If this goes well, we might try to make it a regular thing. And if no one likes it… well, I might still keep doing it anyway because I like reviewing music and sharing my favorite songs with others. Here's how this is going to work. I'm going to do a short write-up of each song I'm obsessed with right now, giving you an opportunity to understand why I love it so much and why you should listen to it, too. You can pick and choose which songs (if any) you'd like to include in your own music collection. Or if you'd like, you can subscribe to my Currently on Repeat playlist and always stay up-to-date on what I'm listening to. Sound good? Good. Let's get started. Warning: This playlist is rated PG-13. I'm not going to include anything with rampant profanity or seriously objectionable themes, but it is intended to be listened to by adults who can appreciate an artistic work without necessarily agreeing with every single component of it or being negatively influenced by its edgier aspects. If this isn't for you, I apologize. If it is, read on. The first single from 5 Seconds of Summer's sophomore album Sounds Good Feels Good might seem suspiciously similar to last summer's hit "She Looks So Perfect" at first glance, but if you think the band is just regurgitating the same successful formula, you're in for a surprise. The title of the song is actually a throwaway, a purposeful distraction from what it's actually about. The song starts off talking about a girl who's not exactly nice ("She's kinda hot, though.") but as the song progresses, you find out that it's not about the girl at all. It's actually an anthem for a generation of young people who are constantly being bombarded with reminders of their shortcomings and want nothing more than to feel OK. The message of the song can be summed up in the simple line, "We're alright, though. Yeah, we'll be alright though." This is actually something I tell people a lot, so I instantly connected with the song's message. "She's Kinda Hot" is catchy, and the style is a little more experimental and fun than anything on the band's previous album. If this is an indication of what's to come with Sounds Good Feels Good, I'm all in. And I can't wait to hear more. I'm probably the last person on the planet to listen to Taylor Swift's album 1989. And now that I've heard it, I regret all the months I wasted resisting the urge to listen to it. It really is that good. Honestly, there are about six songs from that album that belong on this list, but I limited myself to one because I didn't want T-Swift to completely take over my playlist. I chose "Bad Blood" because it's the song that's been getting stuck in my head the most lately, and the only way to get it out is to listen to it. It's ridiculously catchy without being repetitive. There are some clever plays on words in the lyrics. And the song is so brutally honest and relatable that it's tough not to love it. "Bad Blood" is Taylor's tell-all song about a relationship that went sour because the other person simply didn't treat her right. Speculation about who the subject of the song might be aside (I'm looking at you, Katy Perry), Bad Blood is just a fun song to listen to, so give it a try if you haven't already. I'll be the first to admit that Owl City's latest album Mobile Orchestra is definitely not one of his stronger releases. I'm still waiting on Adam Young to come up with an album that even remotely rivals the genius that was Ocean Eyes. But despite its flaws, the newest album from Owl City did deliver at least one legitimate jam, and that's the song "Unbelievable." Not only does it have a hook that will burrow itself so far down into your head that you'll never get it out, but it also features tons and tons of 90's childhood nostalgia, which people my age are eating up right now. The song includes references to "no girls allowed" clubs, the raptors from Jurassic Park, Floam, McDonald's french fries, and more. It's a guaranteed throwback, and the combination of Adam's songwriting with the musical talents of Hanson makes this song a must-listen. Yellowcard is one of those bands that I've always wanted to get into, but I've never actually invested the time to explore their music. I think I was afraid that I would really like them and end up spending lots of money on their songs, which is probably what would have happened. But once Apple Music came along and I knew that I wouldn't be tempted to drop any extra money on Yellowcard music, I decided to try them out. I listened to all of their albums in release order and found that, even though it was one of their older songs ("Ocean Avenue") that originally piqued my interest in the band, I actually enjoyed their newer albums the most. "Here I Am Alive" comes from one of Yellowcard's most recent albums, and it shows a lot maturity both musically and lyrically. It's basically a look back on their career and a wish to go back knowing what they know now. But ultimately, the message of the song is that they've survived all that they've been through. Despite all the ups and downs, here they are alive. I find that very inspiring, and I think that's a message we would all do well to hear. I don't know a lot about The Killers, but I know enough about The Killers to know that I want to be a fan of The Killers. Not only does their music sound great, but they seem to be legitimately cool people. I mean, it takes a special kind of band to write, record, and release an original Christmas song year after year. And that's just the tip of the iceberg on the band's talent. My first experience with The Killers was playing "When You Were Young" on Rock Band. It was one of my favorite songs on the game. When I looked up the band to find out more about their music, every source kept leading me back to this song. "Somebody Told Me" is grungy, raw, and just plain memorable. Everyone can relate to the narrator's struggle, and the chorus is as hilarious as it is true-to-life. There's a reason so many people love The Killers, and there's a reason this is one of their most popular songs. So do yourself a favor and check out "Somebody Told Me." Panic! at the Disco was one of those bands that was just a little too emo for me to be comfortable with when I was in high school. And now that I'm past that critical age where my musical taste was being molded into what it would be for the rest of my life, I honestly can't seem to get into them. But I know that they mean a great deal to a lot of people, and from what I can tell, they're objectively a great band. This was the first song I ever heard from them, and it's the only one I like. It caught my attention not only because it has the kind of chorus that you just have to sing along to but because of the title itself: "This Is Gospel." When I heard it, I thought, "Wow. These guys must be pretty confident if they're going to label their own song 'gospel.'" It's not gospel as in the musical genre. They're saying their music is gospel as in the good news. And maybe to their fans, it is. I'm still trying to figure out in what way their music may or may not be considered gospel, but until then, I'm just going to keep enjoying the song. I suggest you do, too. I've heard it said that often your brain tells you that you like a song when really what it means is that you're just familiar with it. I think that's what happened to me with "Shut Up and Dance." I would consider this song the song of the summer. I hear it playing everywhere. The first time I heard it playing in a store, I didn't really notice it. The next time, I heard it playing in a restaurant, and I thought, "Hey, that line about shutting up and dancing is actually pretty catchy." And the third time, I heard it who knows where, and I knew that I simply had to have that song on my phone immediately. So I opened up my Music app, searched "Shut up and dance with me" (since those were the only lyrics I actually knew), and found the song I was looking for. I have to admit, it really is a lot of fun to listen to. It doesn't have a lot to offer content-wise, but that's OK. Usually the most popular songs don't. It's a catchy, poppy song about a guy and a girl dancing together, and it makes you want to dance along with them. What more could you possibly ask for in the most-played song of the summer? There are a few bands that I would choose, if given the opportunity, to force my younger self to listen to. Blink-182 is one of those bands. I think that a lot of the musicians I listen to have been deeply influenced by Blink-182, but they were a little older than the bands I was into during my high school years. Blink-182 makes incredible music, and now that I've finally taken the time to explore their catalog, I can say that I'm a fan. I just so happened to be listening to Apple Music's "Introduction to Blink-182" playlist a couple of days before my 23rd birthday when this song came on. I knew there was a song out there that had the line, "Nobody likes you when you're 23," but I had no idea what that song was. It's an amazing coincidence that I discovered this song just before I turned 23, and now this song will stay in my music rotation probably until l turn 24. It's a hilarious song about growing up (or not), and I hope that by the end of my 23rd year, I'll be fully aware of my age and acting appropriately, unlike the narrator of "What's My Age Again?". This song and I have actually been on a bit of a journey together. One of my jobs is to run slides for Baylor Chapel, and my boss always picks a playlist to run while the students are walking in and out. This song happened to be one of the songs he chose, so I heard it several times a week last school year, and I always enjoyed it. When Apple Music came out, "Geronimo" was one of the first songs I looked for, and I was disappointed to find out that it wasn't there. So over the summer, I practically forgot all about it. That is, until Sheppard appeared on Girl Meets World and performed the song. This inspired me to try one more time to find it on Apple Music, and this time, it was there. I've been listening to it nonstop ever since. "Geronimo" is about diving headfirst into something that you truly believe in without looking back, and I think that's a feeling we can all relate to, or at least one that I hope we can. It's a song that's exciting and has just enough repetition to be catchy without getting on your nerves. Plus the range of the lead singer is just incredible on this track. It's definitely worth checking out. It'll probably have you saying, "Geronimo!" after just one listen. Oh, look! Finally, a Christian song. I knew this playlist couldn't be completely heathen. This is actually the newest addition to my Currently on Repeat playlist. I heard the song on Air1 when it first came out, and I immediately loved it. Unfortunately, I forgot about it until a co-worker played it for me the other day. It's not only a great song; it's a call to action. No one, and especially no one who claims to believe in Jesus, can listen to "Do Something" and not feel compelled to act. This song serves as a reminder that we live in a broken world, and we are the ones who have been called by God to fix it. It makes me want to get up and do something to make this world a better place, to share the love of Christ with someone in a way that truly touches them. I love this song because every time I hear it, it draws me away from complacency and reminds me of what God wants from me: He wants me—and really each of us—to go out and do something. This is the only song in my Currently on Repeat playlist that isn't available on Apple Music. That's right, if you want to hear this song you actually have to—gasp!—pay for it. But I can assure you that it's worth the money for a couple of different reasons. First of all, it's a solid pop punk track on its own merit. Secondly, it's the debut song from Lights Go Down, the new band fronted by none other than Jason Dunn, formerly the lead singer of Hawk Nelson. Jason quit Hawk Nelson a couple of years ago because the band had gone mainstream, embracing a bubble-gum Christian alternative style over their pop punk roots. He decided to start over by returning where Hawk Nelson originally came from. OK, so they're actually from Canada, but their first big song was "California," a pop punk song about a young man's desire to move to California. "West Coast Calling," the first song from Jason's new band, is naturally a song about a young man's desire to move to California, this time to "do it all over again." It's a return to form for Jason, and he has put together a great group of musicians to start this new journey with. 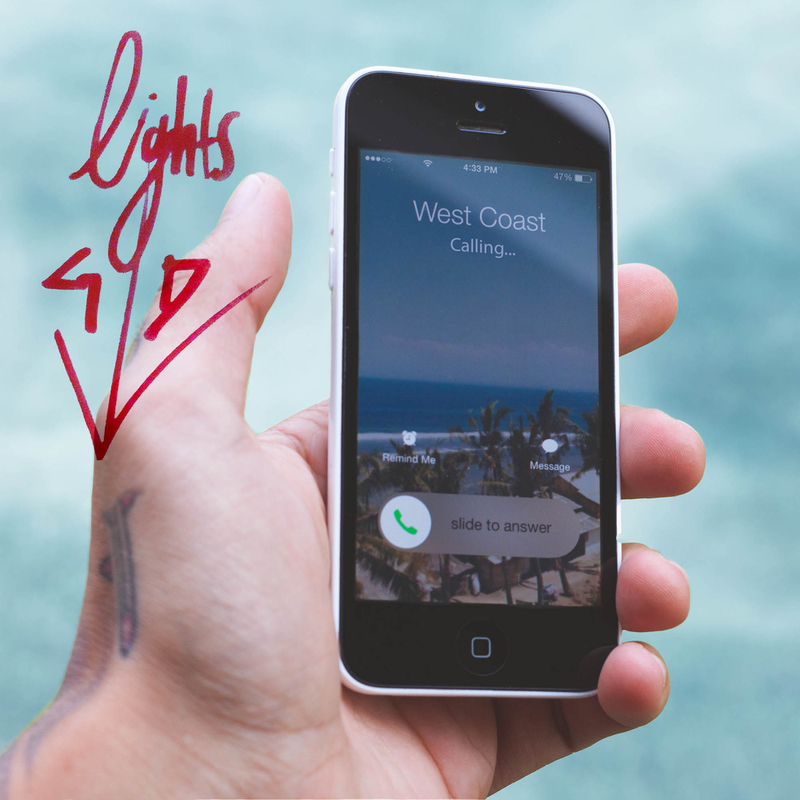 I can't wait to hear more from Lights Go Down, and I would suggest you download West Coast Calling and get on board before this band makes it big. So there you have it. These are the songs I currently have on repeat. If any of these songs piqued your interest, or if you'd like to keep up with songs I find myself listening to in the future, you can subscribe to my Currently on Repeat playlist through Apple Music and alway stay up-to-date. I'd also love to know what you're listening to. What were your favorite songs of the summer? Did any of my songs overlap with what you've been listening to? And are there any artists or albums you're really excited about right now? I'm always looking to discover good music, so leave your suggestions in the comments, and I'll be sure to check them out!